In Maine there is a heated debate roaring about changing construction setbacks for vernal pools. A vernal pool (sometimes called vernal ponds or ephemeral pools) "are temporary pools of water. They are usually devoid of fish, and thus allow the safe development of natal amphibian and insect species." (Wikipedia) A bill that would allow development closer to vernal pools drew enthusiastic support from landowners and strong opposition from environmentalists Monday at a hearing before the Legislature's Environment and Natural Resources Committee. The current regulation requires a setback of 250 feet. That number is under constant critique, making for exciting and sometimes even explosive conversations at cocktail parties and social gatherings. (Well, at least at the social gatherings we attend.) The bill proposes dropping the setback down to 75-feet. A summary of the legal language on the bill itself is... "This bill changes to 75 feet the setback for significant vernal pool habitat, high and moderate value inland waterfowl and wading bird habitat and shorebird nesting, feeding and staging areas. It also provides a mechanism to compensate landowners for the property value losses incurred as a result of more stringent setback regulations." Permitting landowners to seek compensation from the state for the amount of any property value losses incurred as a result of more stringent setback regulations that apply to areas containing significant vernal pool habitat may result in General Fund costs that will, according to the Department of Environmental Protection (DEP), potentially eclipse $2 million in fiscal year 2011-12. This cost would be exceeded if more than 200 landowners qualify for an average of $10,000 in compensation under the bill. Reducing setback requirements for the regulation of areas containing significant vernal pool habitat may also result in a minor reduction to DEP permit fee revenues. This bill has support from three state agencies: the Department of Inland Fisheries and Wildlife, the Department of Environmental Protection, and the Department of Conservation. The Portland Press Herald quotes Conservation Commissioner, Bill Beardsley as saying salamanders and frogs that need vernal pools can survive in smaller areas than what's now protected. "We're not dealing with an endangered species," he said. "We're talking about salamanders and wood frogs." How much setback is necessary to truly protect this type of habitat is tricky to identify. Part of it depends on what type of construction takes place nearby and how it's done. Then there is the question of what exactly qualifies as a vernal pool. 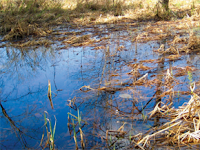 Not every skidder rut or mud puddle falls under the state's description of a vernal pool. So before you get too worked up about the issue, consider whether you have an actual vernal pool in your back yard or if you're looking at a rut from your lawn tractor. (Here's a link to a long article on the subject and a link to the State Bureau of Land and Water Quality web page for vernal pools.) Regardless of which side of the line you find yourself sitting, now is the time to contact your state legislator. The committee will hold a work session in the coming weeks to vote on the bill.